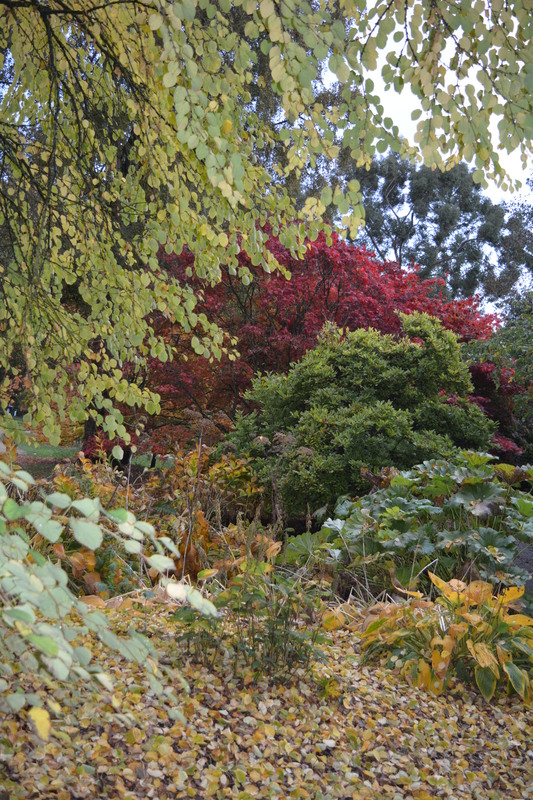 We made a special effort to get to see several different arboreta this autumn. 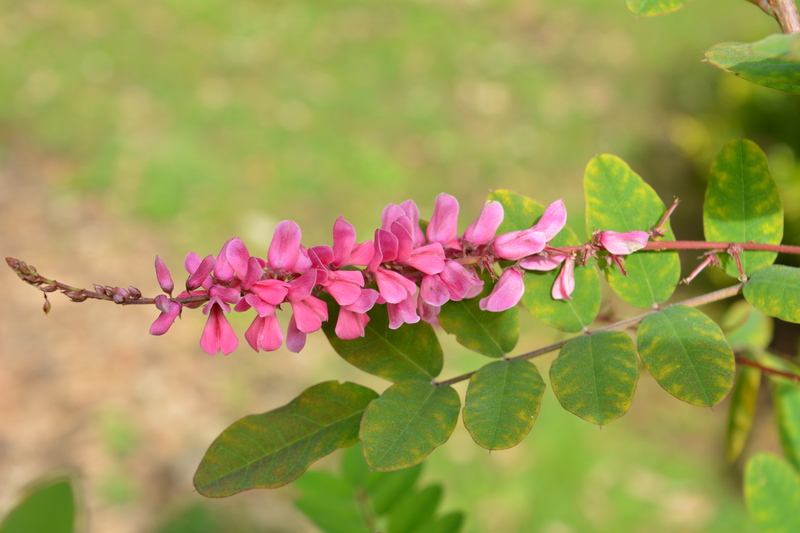 We visited our friend Richard’s arboretum twice, then drove northward to the Bluebell Arboretum and Nurseries and finally south to Batsford Arboretum in Gloucestershire. 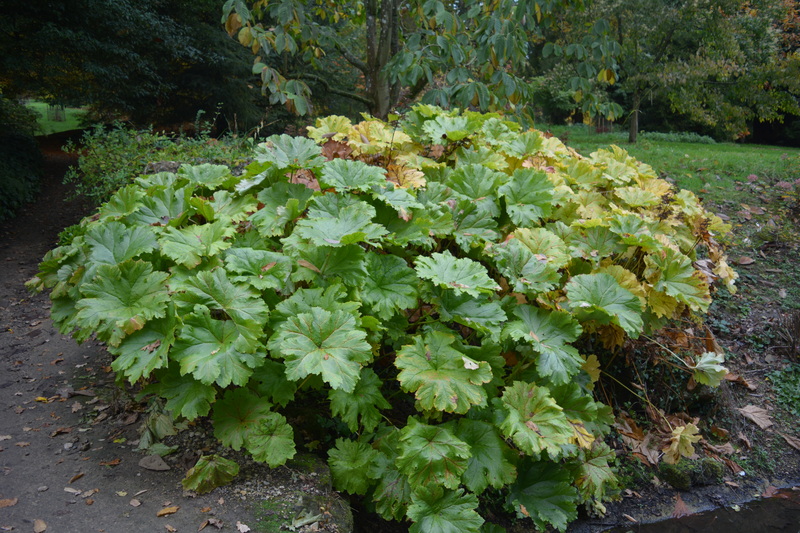 Batsford is one of the biggest and oldest arboreta in the UK and a very well-known one so provided a good contrast to Richard’s place and Bluebell as these are relatively small and both just over 20 years old. 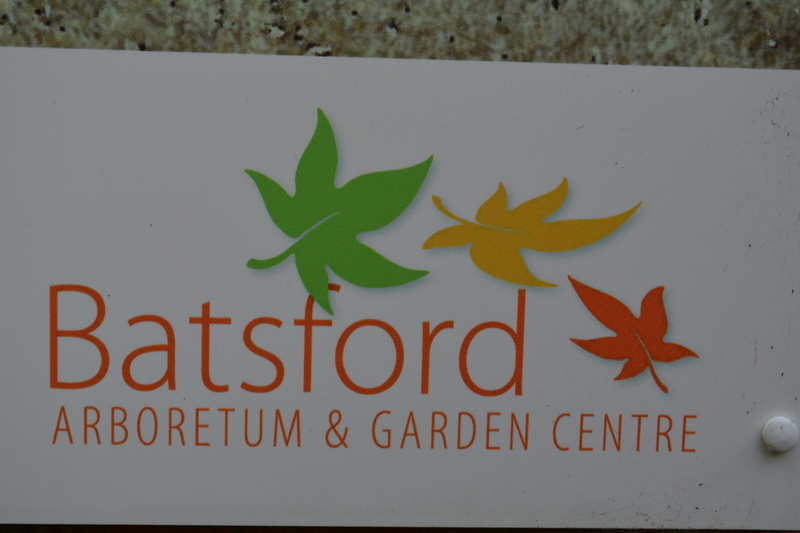 Their own publicity leaflet describes Batsford as “The Cotswold’s Secret Garden” but judging by the number of visitors even on a dull day it seemed far from a secret. 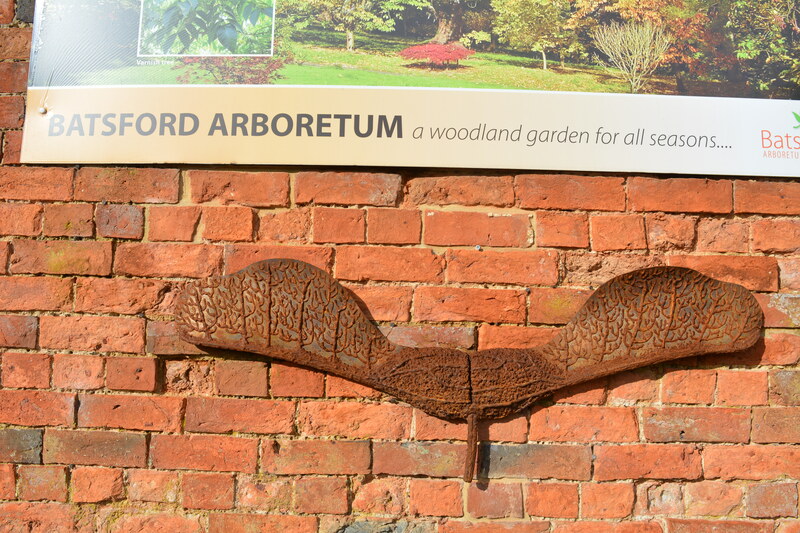 New borders lined the gently sloping pathway leading down from the car park to the reception area. 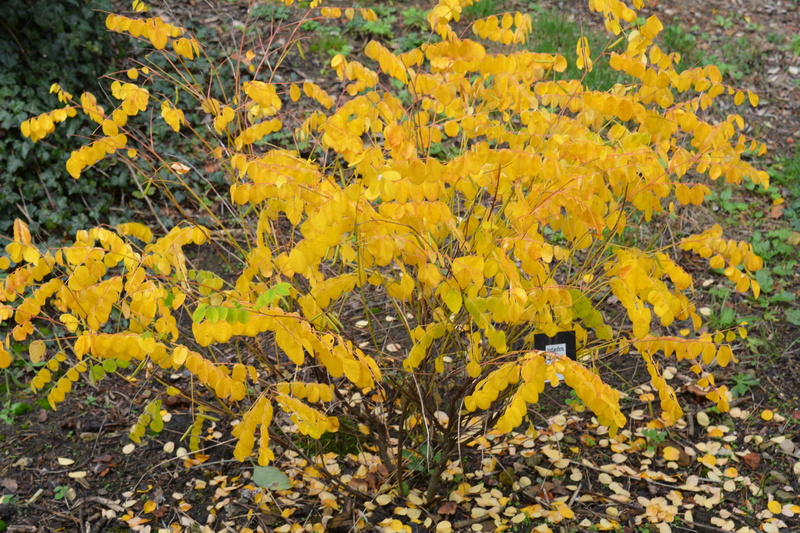 The beauty of the planting here which included this yellow berried Sorbus and two very different Indigofera, prepared us for the treats we had in store. 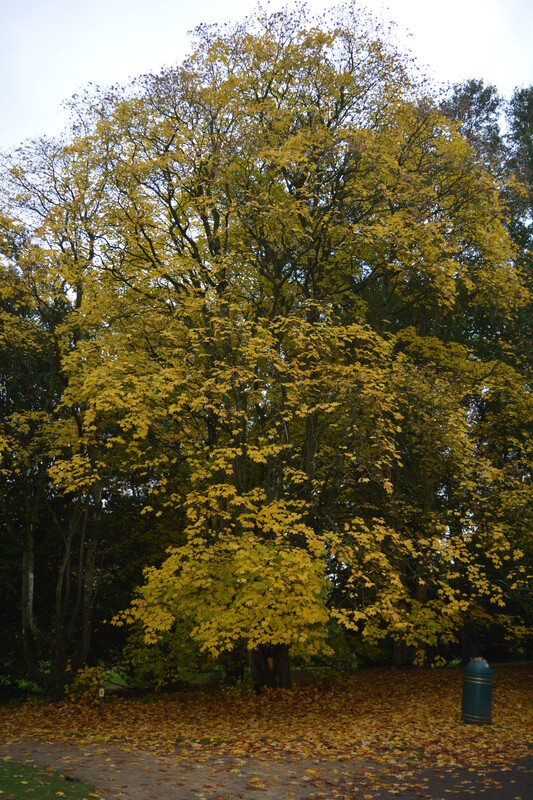 After walking just a few yards from the entrance we came across a special tree – one of those specimens that stops you in your tracks and starts the brain and memory off trying to work it out. 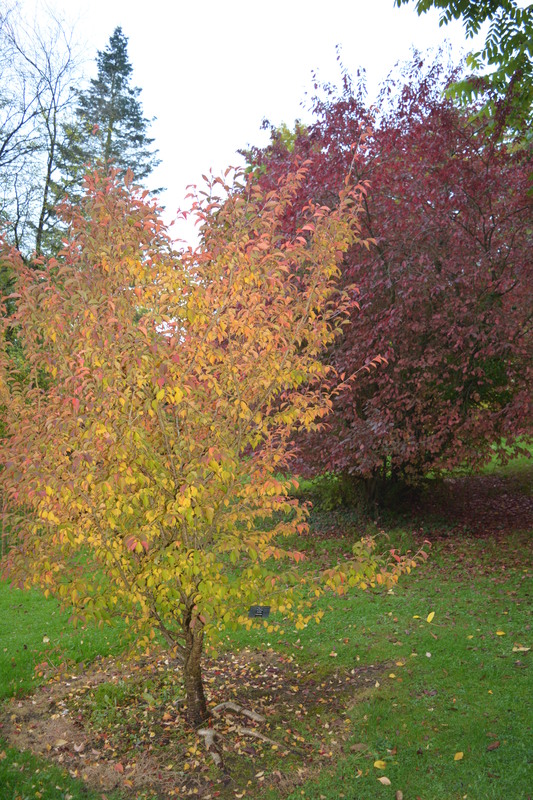 It was like a Cotoneaster in leaf and growth habit but it had black berries rather than the more usual red. 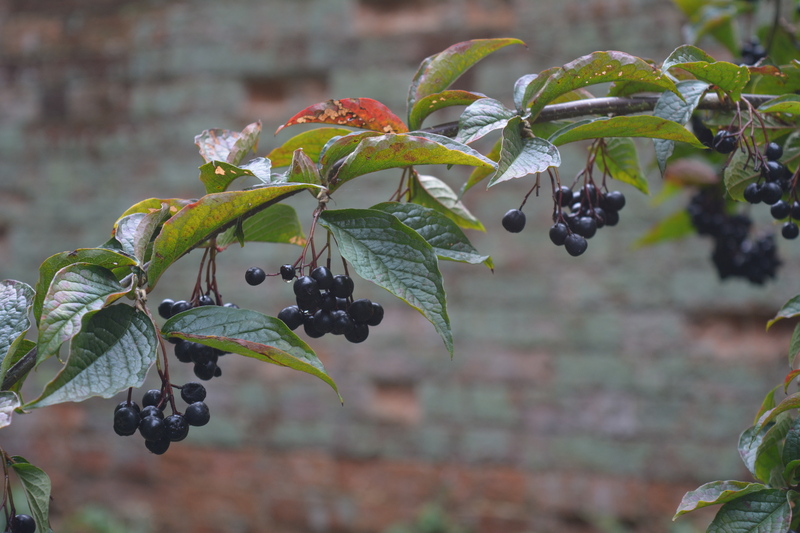 Luckily it had a label and it was indeed a black berried Cotoneaster. 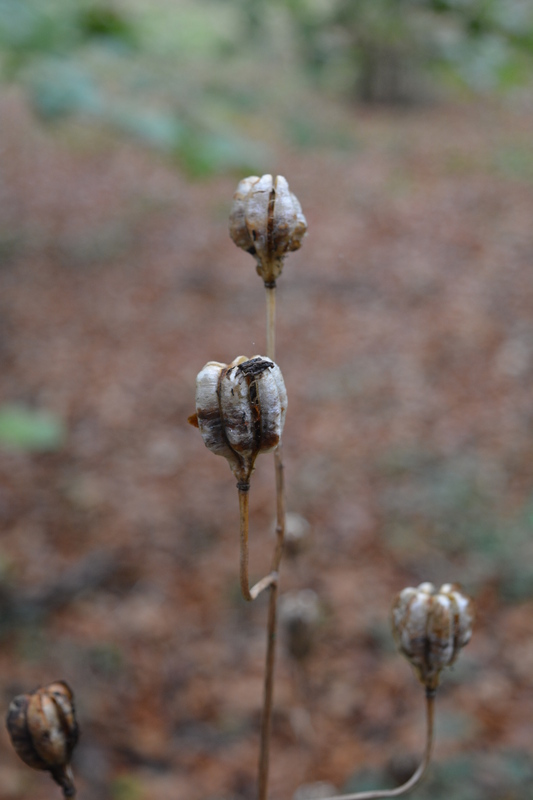 Here was a plant we had never seen before or even knew existed. 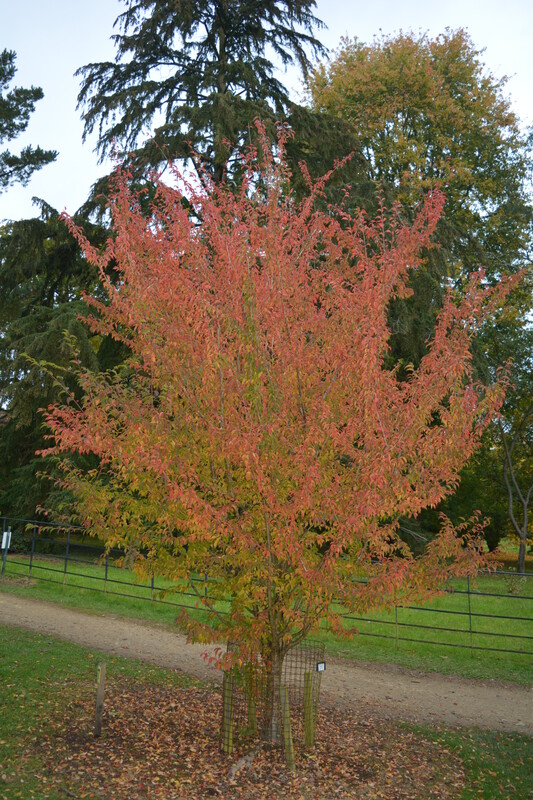 It is called Cotoneaster moupinensis. This was going to be a good day! 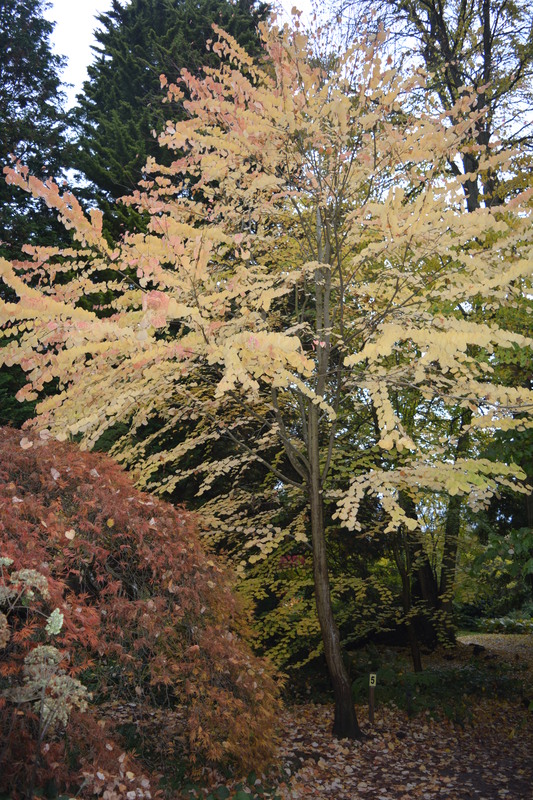 Contrasting leaves in shape and size make for good plant combinations, such as this large leaved Dalmera paltata in front of the delicately leaved Acer palmatum. 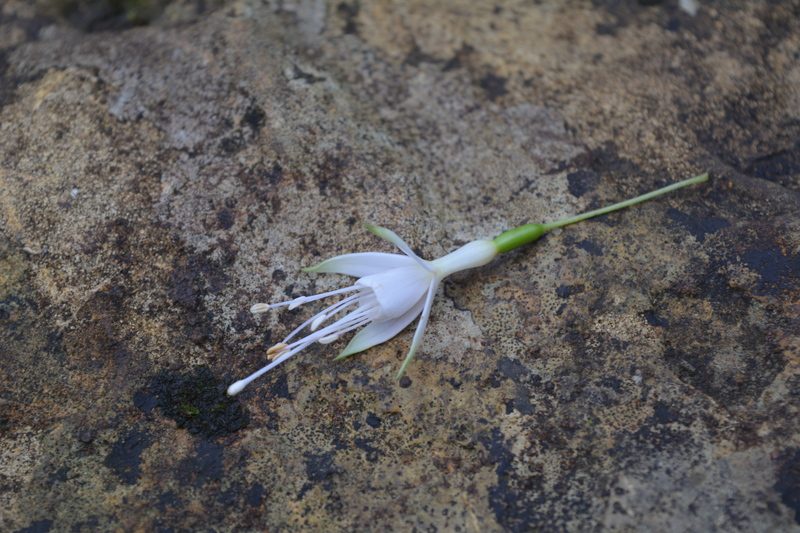 We liked the contrast between the slim fragile white Fuschia flower and the gritty surface of a capping stone as we crossed over a bridge. 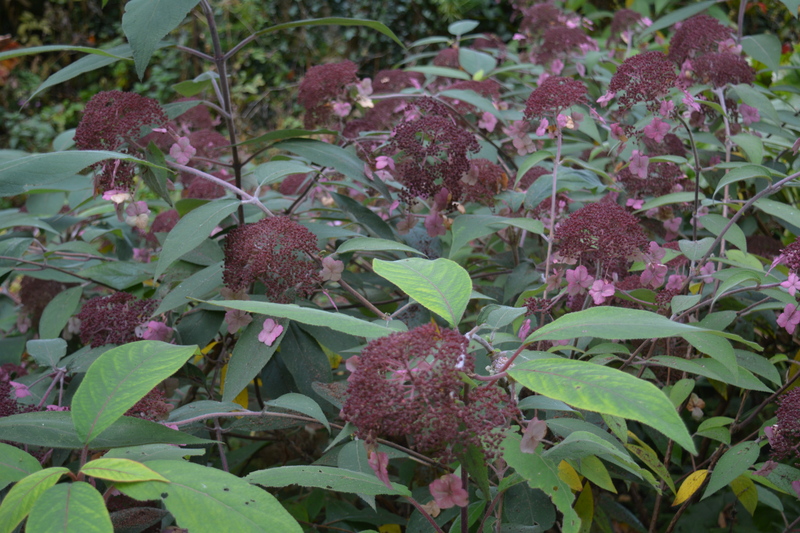 Autumn visits to any arboretum means colourful foliage but we always find flowers of interest flowering in this season too, Hydrangeas, Viburnum and an unusual flowered Heptacodium. 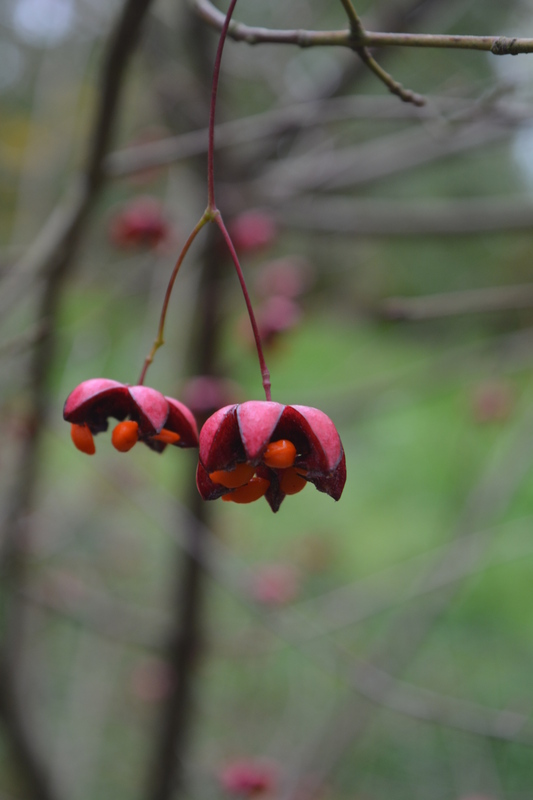 Berries too caught our attention among the colours of fire, the yellows, oranges and reds especially this particular Berberis dripping with long racemes of red berries. 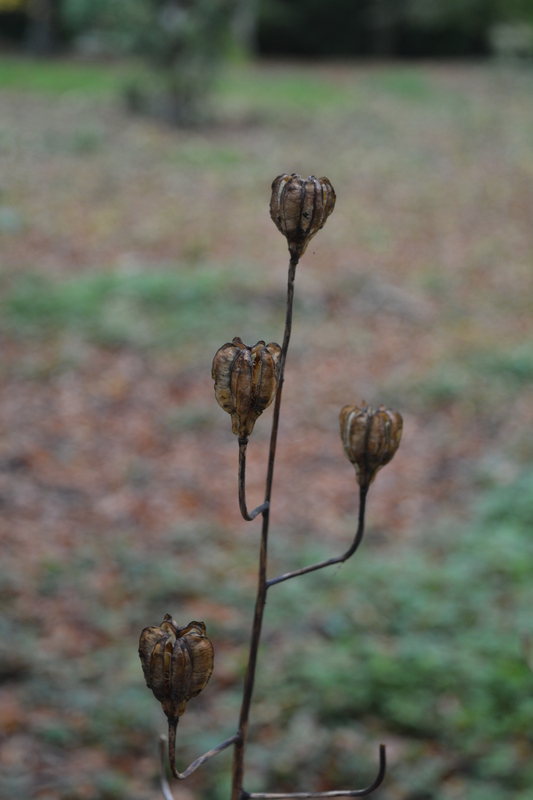 Nearby rose hips dripped from the plant which had lost all its leaves. 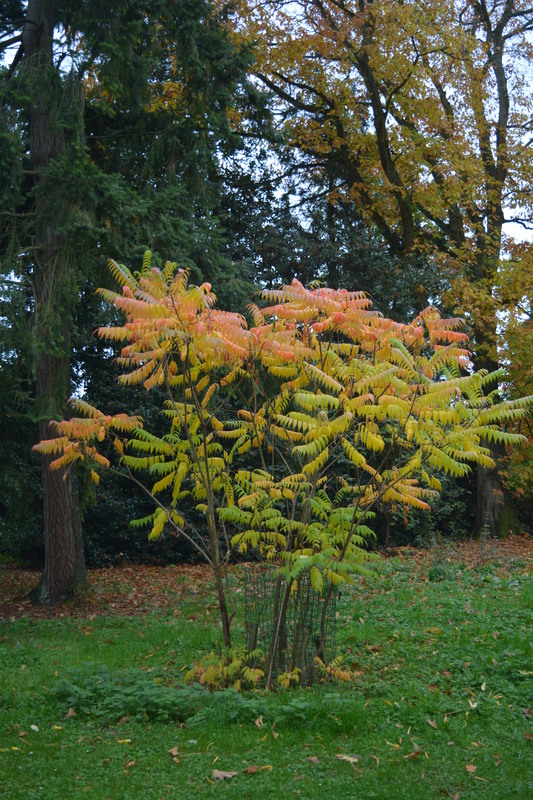 Sorbus pseudohupahensis “Pink Pagoda” bears berries of pin and white which from a distance gives the affect of pink mist. 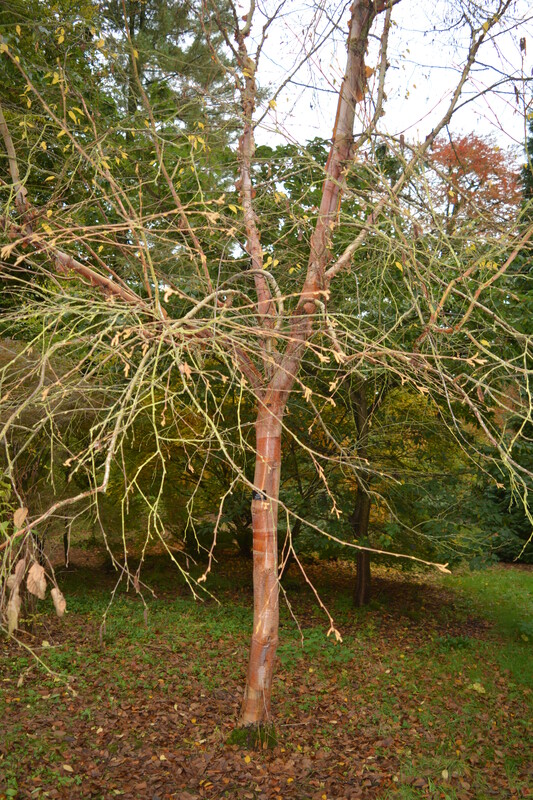 Another Sorbus attracted us by the sheer size of its pure white berries, Sorbus cashmeriana. 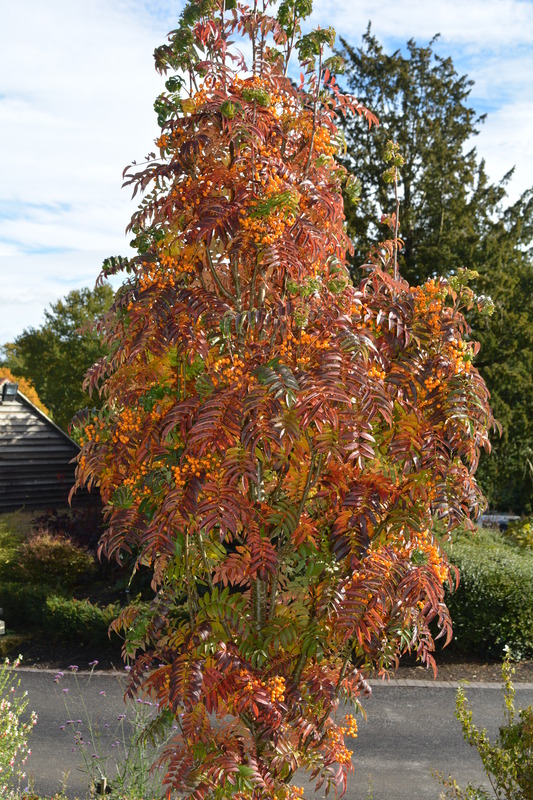 Sorbus scalaris like most Sorbus displays red berries but what is most noticeable with this tree is the uniformity of its foliage which was hanging on into the autumn. 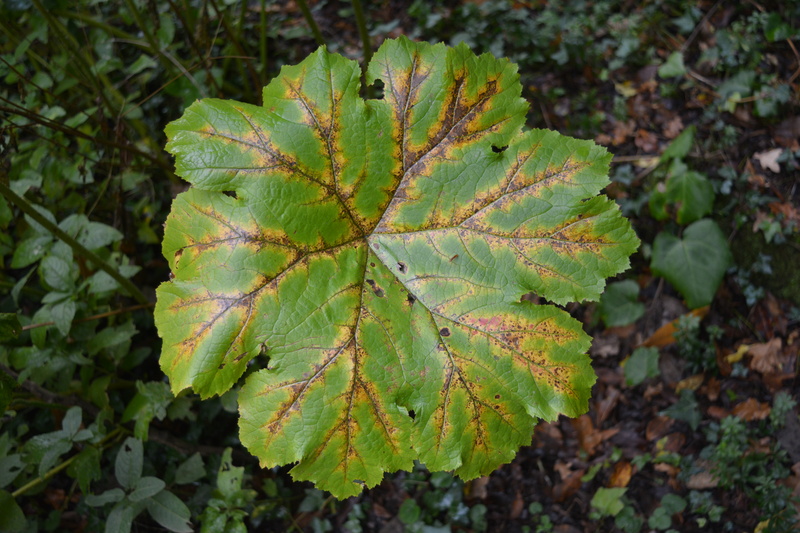 Remember the Dalmera peltatum which I showed teamed up with an Acer, well we found several large clumps of this bog-loving plant around Batsford. 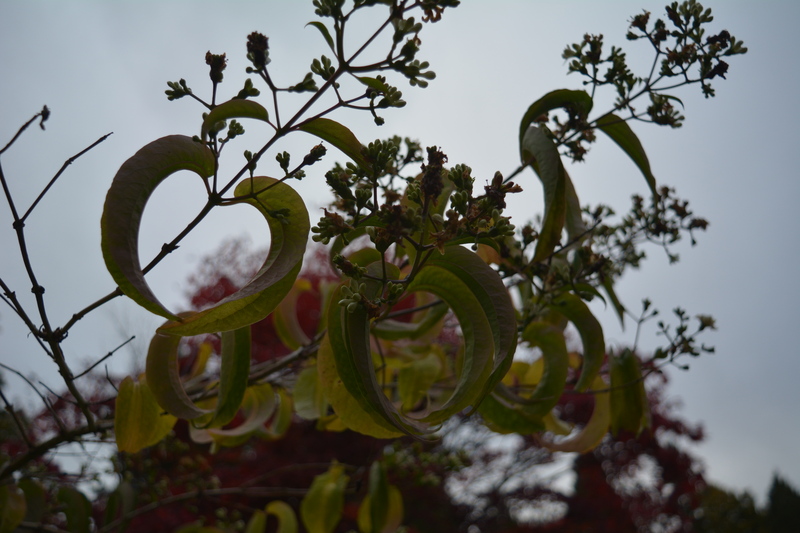 I enjoyed getting up close and looking through the Nikon lens at the details of their giant leaves. 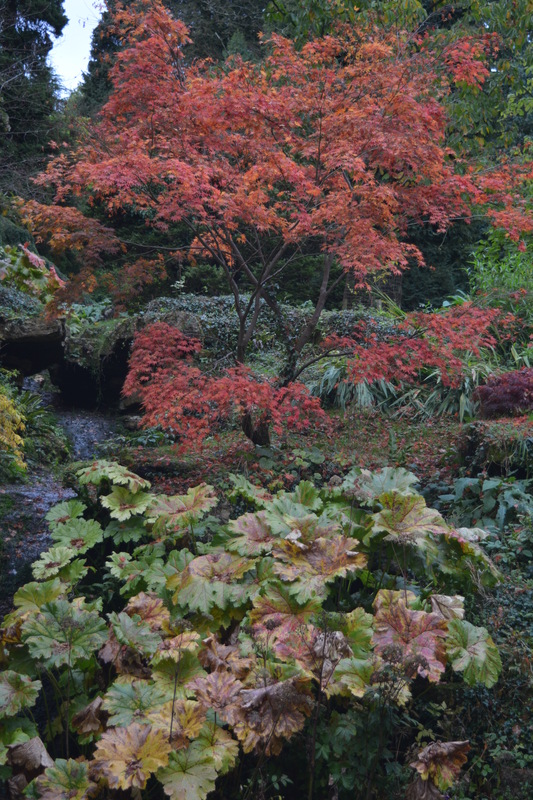 No arboretum visit in the autumn can be reported without celebrating the family of Acers. Enjoy! 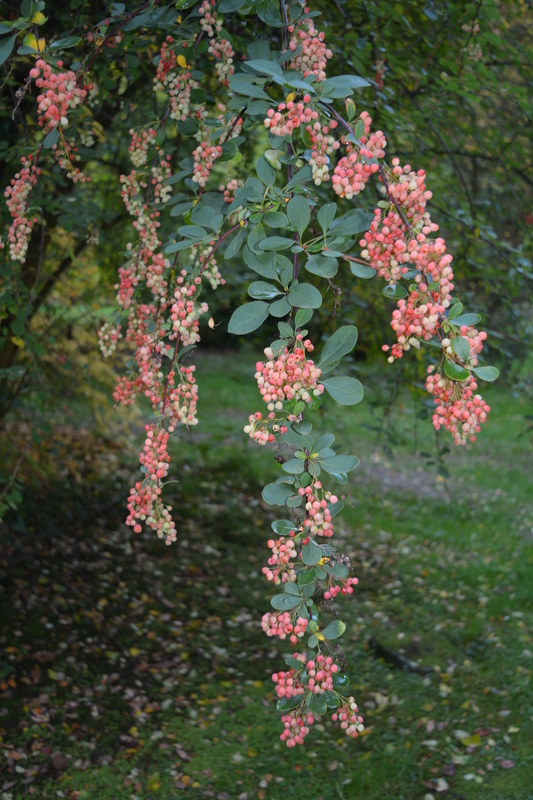 As we moved on along the trail we were literally stopped in our tracks at the sight of the Berberis with its incredibly long and unusually coloured racemes of flowers. 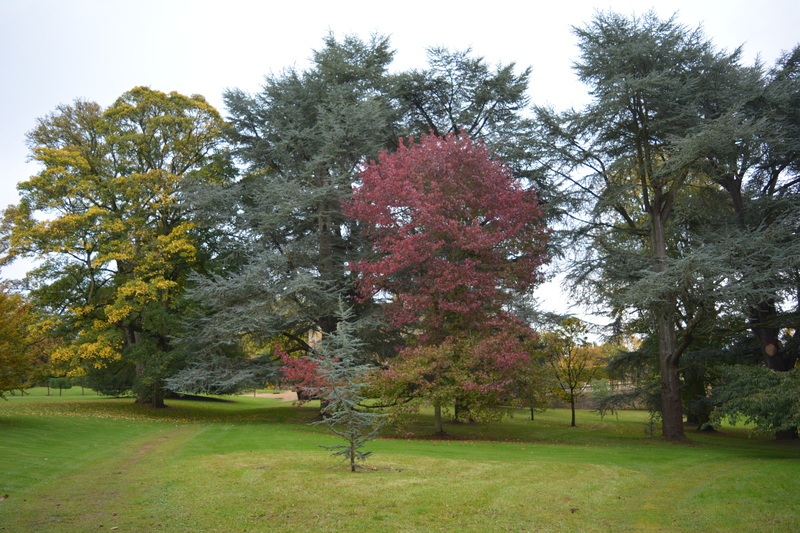 Around the next bend in the path this beautifully coloured cherry tree glowed a salmon pink colour and we rushed to read its label. 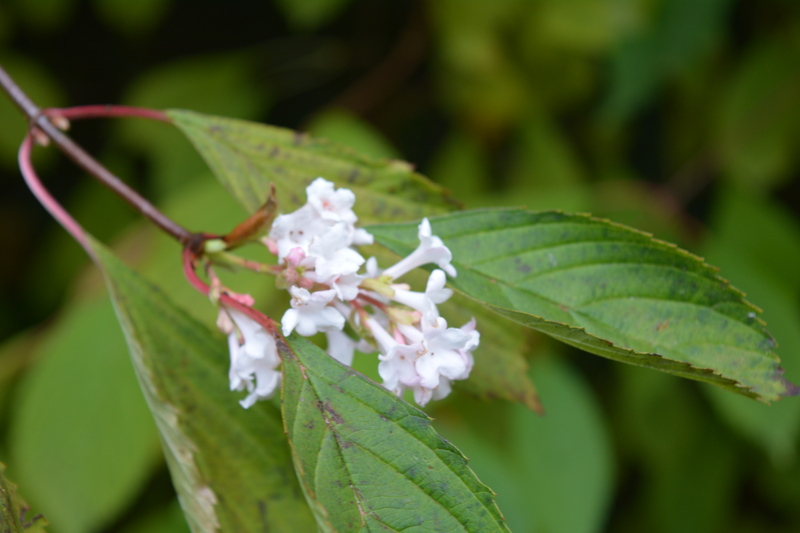 We discovered it was a close relative of a tiny flowering cherry we grow in our Japanese Garden at home, Prunus incisa “Kojo-no-mai”. 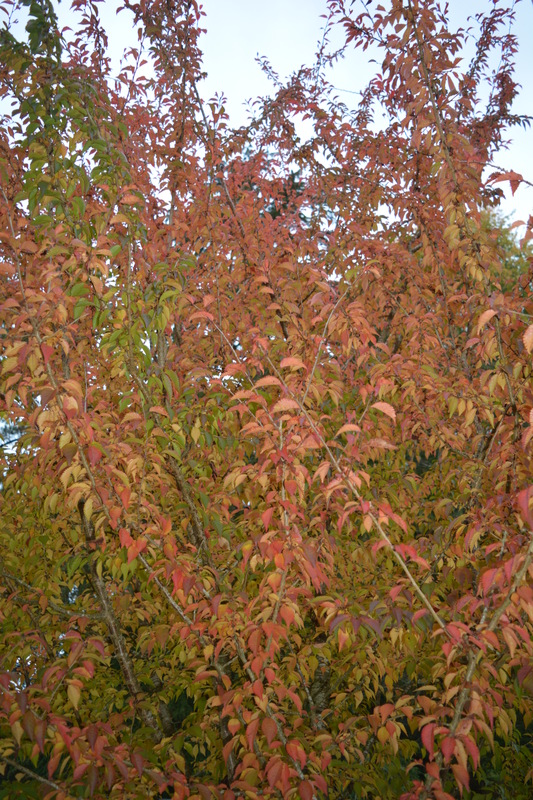 This much larger tree was Prunus incisa fuginaea, the Fuji Cherry. 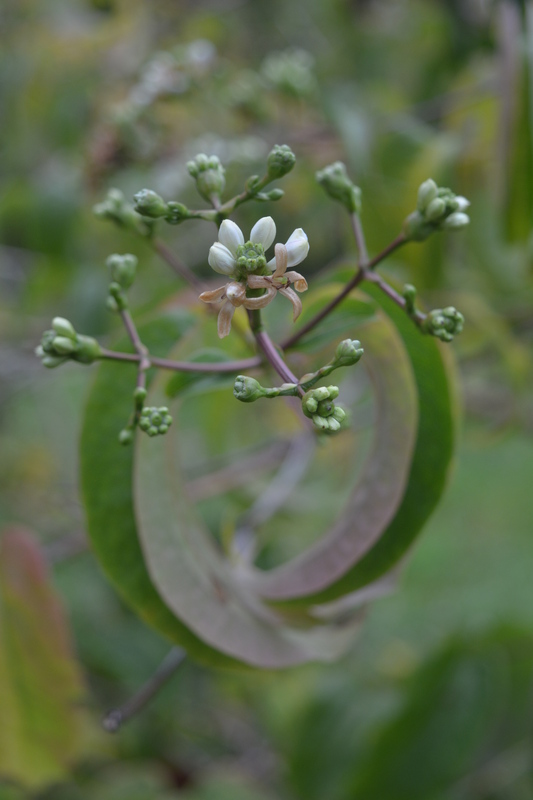 We could only guess at how spectacular it must look in flower. 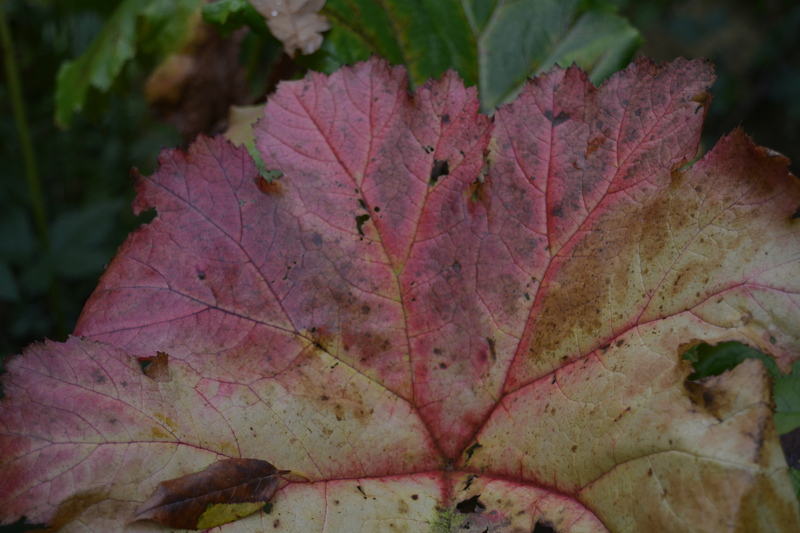 We wandered on stopping frequently to look for labels, sometimes to confirm what we thought trees and shrubs and sometimes to find out. 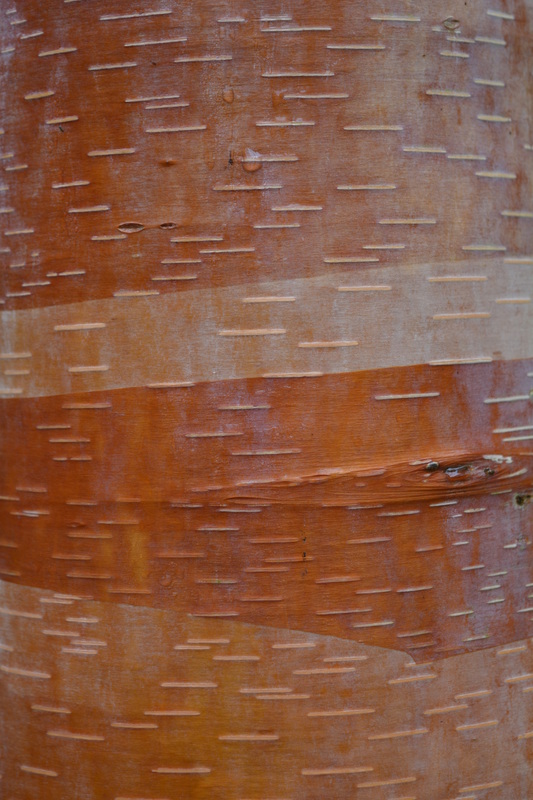 I always manage to find Betulas (Birches) in every arboretum we visit and here we came across the beautifully coloured bark variety, Betula albosinensis Septentrionalis. 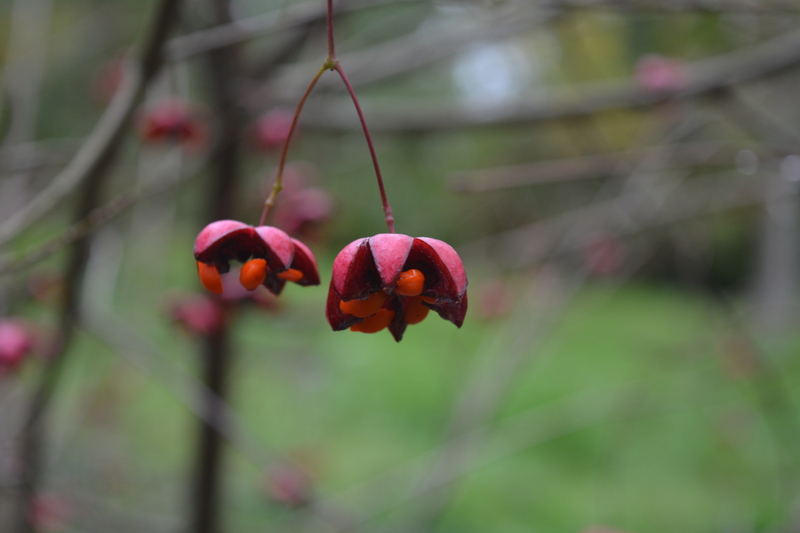 I shall finish this first post about Batsford with another favourite, this time a shrub, a deciduous Euonymus, Euonymous oxyphyllus, which flowers and berries in remarkable style. 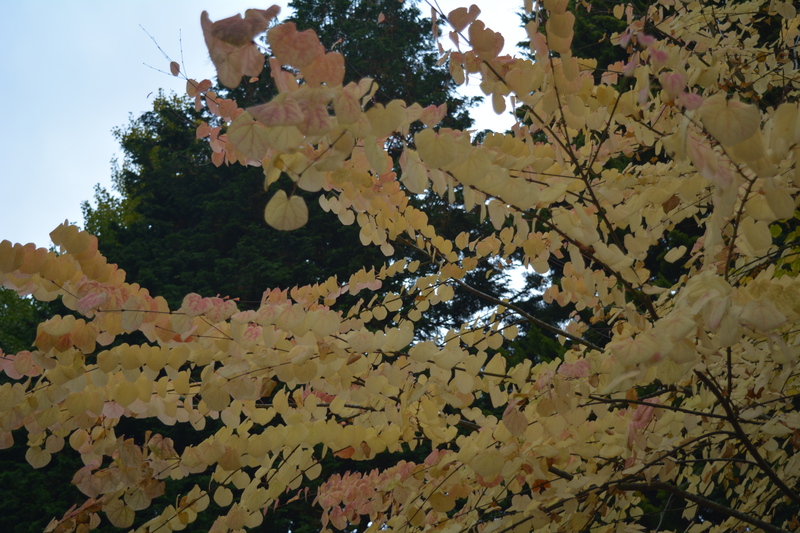 This entry was posted in arboreta, garden photography, gardening, gardens, gardens open to the public, ornamental trees and shrubs, shrubs, trees and tagged arboreta, arboretum, Batsford Arboretum, berberis, betula, betulas, deciduous euonymus, ornamental shrubs, ornamental trees, trees and shrubs. Bookmark the permalink.